Felt like taking a little culinary adventure. These bad boys are native the Crimean region and most ex-Soviet states. When I was little, we would get these from street vendors in Russia. 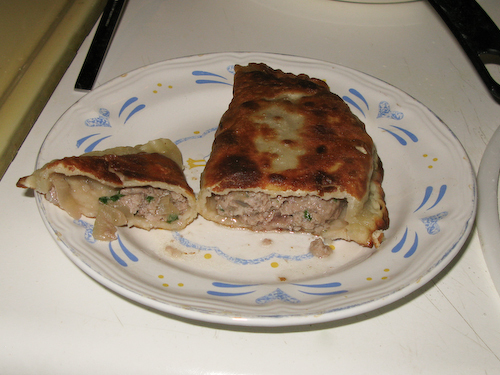 Simple dough and meat filling, very similar to Empanadas. 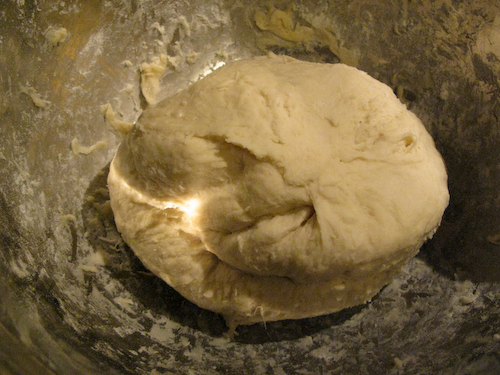 Knead the dough until it no longer sticks to your fingers. 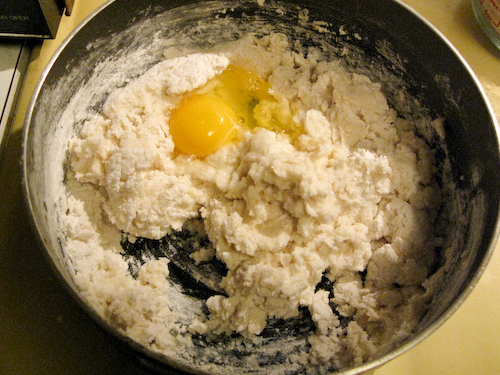 Add more flour and it keeps sticking. Put in the fridge and let it sit there for an hour. Knead one more time half way through. 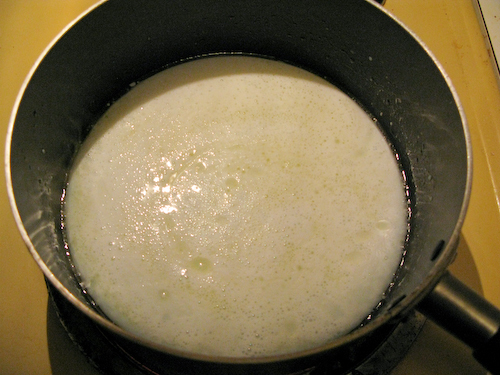 Combine all the remainder of the ingredients in dish, making sure it is evenly mixed. 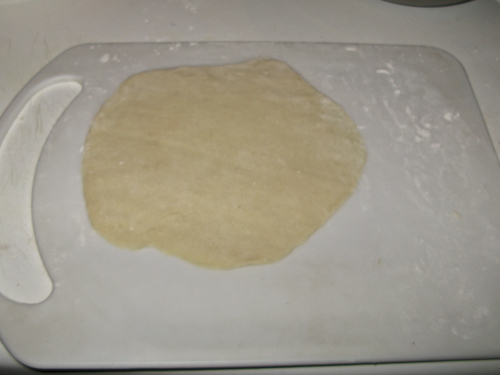 Roll out the dough on a floured surface to thin large circles, about the diameter of a plate. 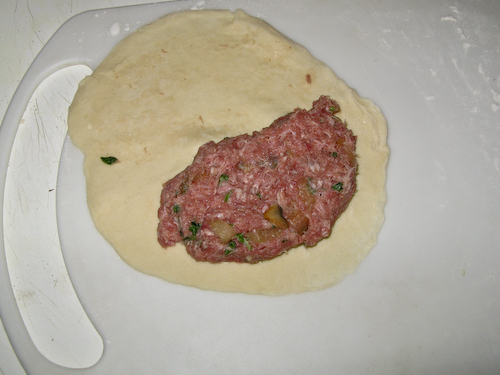 Place about 2 table spoons of the filling on one half of the dough, leaving a little room between the meat and the edge. 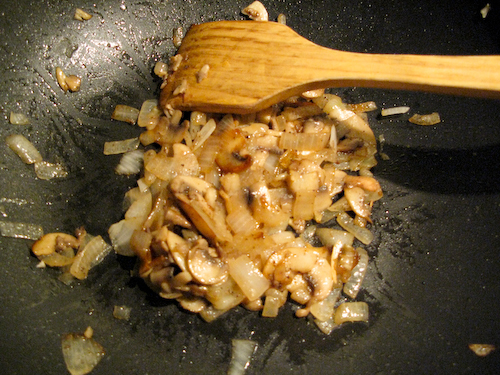 Fry or deep-fry the pocket in vegetable oil, flipping as necessary, until golden brown. 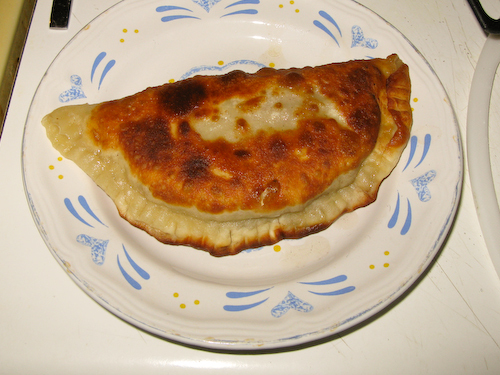 If you’re having trouble with not cooking the meat through, place the finished Chebureki in a pot and bake in the oven on 250-300 F for about 20 minutes or until fully cooked through (this really shouldn’t be necessary). Posted in: Beef, Lamb, Meat Dishes, Pork. I have been wanting to learn how to cook authenic Russian food for so long. I just ran across your website, and I am thrilled!! I love the layout..very helpful! P.S. I also came to America in 96! I grew up in west central North Dakota in a Russian German area. One of the popular foods was fleischkuechle. It looks very similar It looks like chebureki might be the origin. Looks and sounds tasty. I made these tonight, they were excellent. I used all ground pork since I had just enough for the full 3 cups of filling. I paired it with your borscht recipe, also quite good. Your site is inspiring me to try new things! 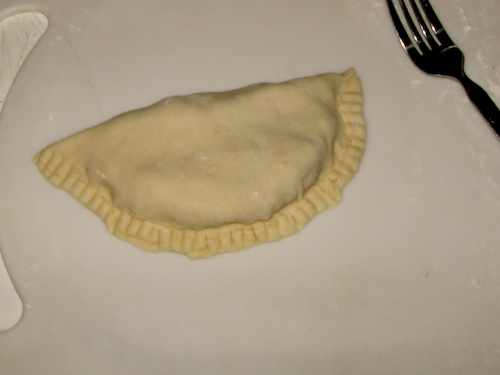 Does anyone know of a recipe to make chebureki gluten free? I have made these for over 40 years and can no longer have gluten.. Any help is greatly appreciated. Seriously craving this! This recipe uses all purpose flour so it’s definitely not gluten free. You can try using gluten free flour, but I can’t attest to how good that would be. I’ve always used the premade empanadas discs at the grocery store in the frozen section here in Miami, only because I didn’t want to go through the trouble of kneading dough, but I have a bowl mixer now so I’ll definitely try the dough recipe. 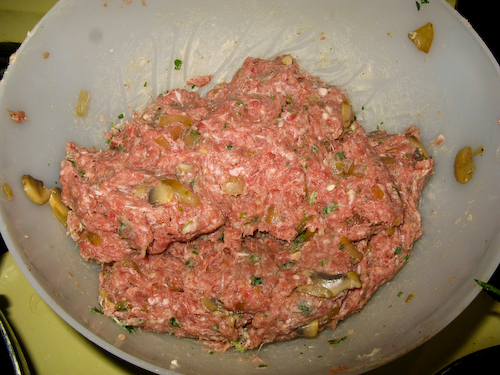 Lastly, I use all beef because I don’t eat swine, and I cook it before stuffing the shells. It’s makes the meat more flavorful this way, and ensures its thoroughly cooked. 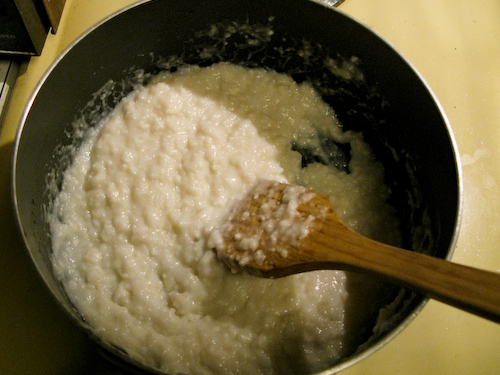 another Crimean specialty is Kubeteh. Does anyone know what that is or have a recipe for it. My mother and grandmother were from Kerch and made Kubeteh for special occasions. I would love to know if anyone else is familiar with Crymchak food. This reminds me on my travel to St Petersburg. A friend served gave this as a treat. Thanks for sharing!